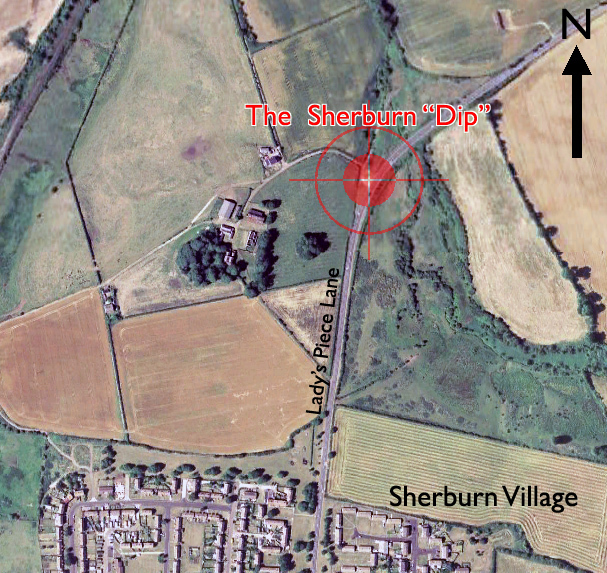 The Ghost of the Sherburn "Dip"
Sherburn is a very old village, much older than Durham. 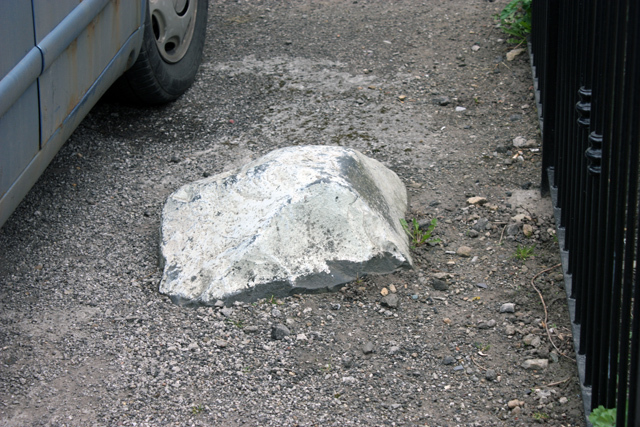 One of the under-estimated artefacts is the 'Blue Stone' of Sherburn, now sadly painted white and buried into the pavement outside of the local bakers. This is believed to be a meteorite which was almost certainly worshipped by the pre-Christian inhabitants of Sherburn, perhaps even with human sacrifice. The road between this stone and The Blacksmith's Arms at Pittington cross-roads has a sinister reputation. Particularly notorious is the part of the road known as the "Sherburn Dip" which is a location on the curiously named Lady's Piece Lane. "However, there was another unfortunate murder at Pittington where the victim was not granted such a sacred burial ground. This particular victim was buried somewhere along the westerly back road that links Low Pittington with High Pittington. The circumstances surrounding this event may owe more to legend than fact and the back road in question is Lady’s Piece Lane. The story – of which there is admittedly very little detail – was perhaps created to explain the road’s unusual name, but whether the inference is that the lady lies at peace or in pieces is open to question". Interestingly, the road has another famous murder associated with it. The Hallgarth Mill murder. "It was at 6pm on Sunday, August 14, 1831, while the mill owners were away that Thomas Clarke, a servant boy at the mill, alarmed the residents of the village of Sherburn with the news that six Irishmen had broken into the house at Hallgarth. Clarke, who was in a most distressed state, claimed that the Irishmen had ransacked the house for its money, and then assaulted him with a poker before brutally murdering the servant girl. Returning to the mill with the people he had informed, the girl’s body was found in the kitchen with several brutal wounds including a cut to her throat from ear to ear". This unfortunate young man, who denied his guilt to the very last was hanged on the "New Drop" which was situated on the walls of Durham Courthouse before a record crowd of more than fifteen thousand people and then his body was anatomized as a further punishment. 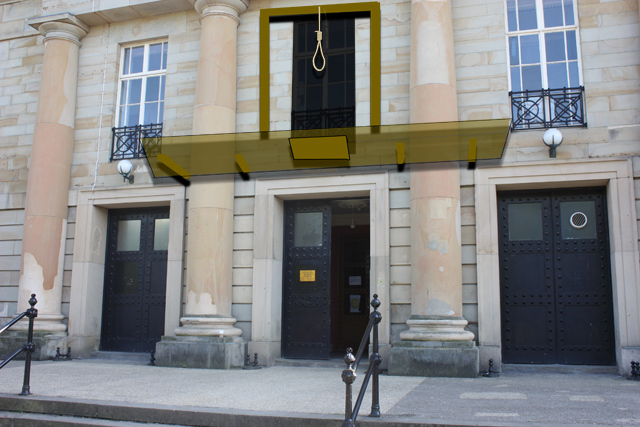 An impression of the "New Drop" as it might have appeared on the front of the Courthouse. It was first used in August 1816. The building opposite, a few yards away from the Dun Cow, has a convenient balcony where the gentry could get a better view of the proceedings on payment of a small fee. Finally, Lady's Piece Lane, would almost certainly have been walked by infamous mass murderer, Mary Ann Cotton, who was born and raised in Low Mooresley just over the hill. *Picture believed to be a public domain image. 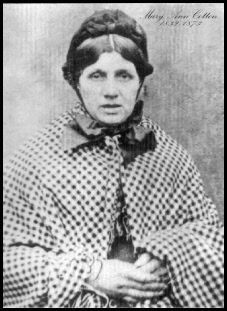 Fuller details can be seen on the Mary Ann Cotton web pages. This is one of our favourites, but you will have to do the tour. It will be worth it. One of the most underestimated tourist sights in Durham is the Chapel of Durham Castle. It is often introduced as a throw-away at the end of the tour, but it is absolutely fascinating. The painted walls are fading fast so go and see it soon. You have a lot of early Christian symbolism, no crosses (from what I can remember) but lots of bestiary symbolism and even Jesus in Green Man symbolism. Also, it that a Templar gravestone in there? Take a look and find out. As a group we tend to be wary of castle ghosts because in reality most hauntings take place in the homes of ordinary people. There is a lot of Greek tragedy symbolism about traditional ghost stories – important things only happen to important people – so if an important person dies then that must leave a ghost. Bishop Van Mildert’s wife falls downstairs and dies therefore her ghost must haunt the castle in the form of a white lady. Allegedly. Just about every castle has a white lady, or a grey lady that glides serenely down the corridors at night when nobody is there to see it. Good for tourism: good for the bank balance. Unfortunately nobody we have talked to, and that includes a lot of students who have lived in the Durham Castle over a period of about 20 years, have seen the grey lady. However, several Durham University students and staff have talked about strange goings-on in Durham Castle Room 21. One of the most detailed stories is the tale of Frederick Copeman, one of the first students at Durham University in the early 19th century. According to the legend, the undergraduate lived in the highest room in Durham Castle, at the top of the Black Staircase. When the results of the final exams were pinned to the notice-boards on Palace Green – first class at the top, second in the middle, third at the bottom, those who failed with names absent – Copeman was seen frantically scanning the results for his name only to find it wasn’t there. He went back to his room in despair and was heard pacing the floor before finally, rushing from his room and racing to the top of the cathedral tower where he threw himself to his death. It later emerged his name had been at the top of the first-class degree list, but had been obscured by the sheet pinned above – and to this day phantom footsteps can be heard pacing the floor in Copeman’s old rooms. According to David Butler, who is a County Archivist and runs a tradition ghost story walk of Durham City, Frederick Copeman’s old room is now disused. Others, both students and staff, who have done the DPRG tour, have talked about poltergeist activity in Room 21, some of it quite disturbing. Room 21 was also named as having poltergeist activity by the now-defunct paranormal group Avalon Skies. What remains uncertain is whether the room that is currently designated as Room 21 in the castle is indeed the former accommodation of poor Frederick Copeman. Furthermore, is there any current poltergeist activity in Room 21 or the disused former Room 21, if there has been some renumbering? Come on, Durham University, enquiring minds need to know. You might also want to check out the “Great Lumley Ghost Story” which took place just after the Civil War and concluded in a building between the Castle and Cathedral which is now part of Durham University. This building was once used as a court house and allegedly a ghost appeared in court to testify against two men who murdered her. She must have been a persuasive witness because the two men were convicted and executed. Strange that nobody talks about it. There was a heroic last stand against the Norman invaders on Palace Green: so many died that Saddler Street was turned into a river of blood. Similar stories are told about Redhills Lane, just down from Durham Johnston School, after the Battle of Nevilles Cross.